We celebrate our local town with its people, places, businesses and organizations! 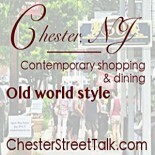 Our goal is to share information about Chester NJ shopping and dining, showcase the special places and events that are part of local life here, to highlight the businesses and people that are part of the community, to help spur interest, excitement and local pride and to invite visitors to come and visit or to stay and live in the community! Come join us on our journey! Chesterstreettalk.com is published by Barbara Clark Collins. Thanks for reading Chester Street Talk! Send your favorite memories and photos of Chester to blc102@gmail.com or danabaardsen@gmail.com, including your first name and location! CHECK OUR EVENTS PAGE - LOTS GOING ON!